Cover Photo: Woodhouse's Scrub-Jay, Colorado, January 2011 © John Breitsch . Note the contrasting white throat against the dusky underparts and the less contrasting and less extensive light blue breast patches. 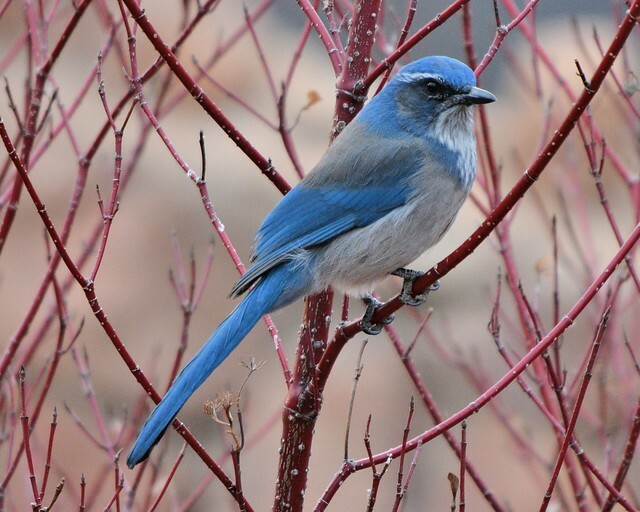 Compared to a California Scrub-Jay, the blue upperparts are also a lighter, grayer color. Note how the upper breast sides are concolorous with the back. Not visible in this photograph, the bill is usually more pointed and less hooked than California Scrub-Jay and the undertail coverts are light blue. 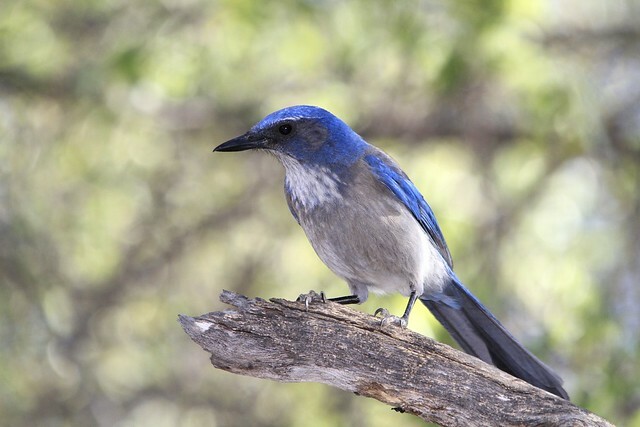 This summer, many birders who have birded across the southwest US were awarded an armchair tick with the AOU split of Western Scrub-Jay in to 2 species; Woodhouse's Scrub-Jay and California Scrub-Jay. 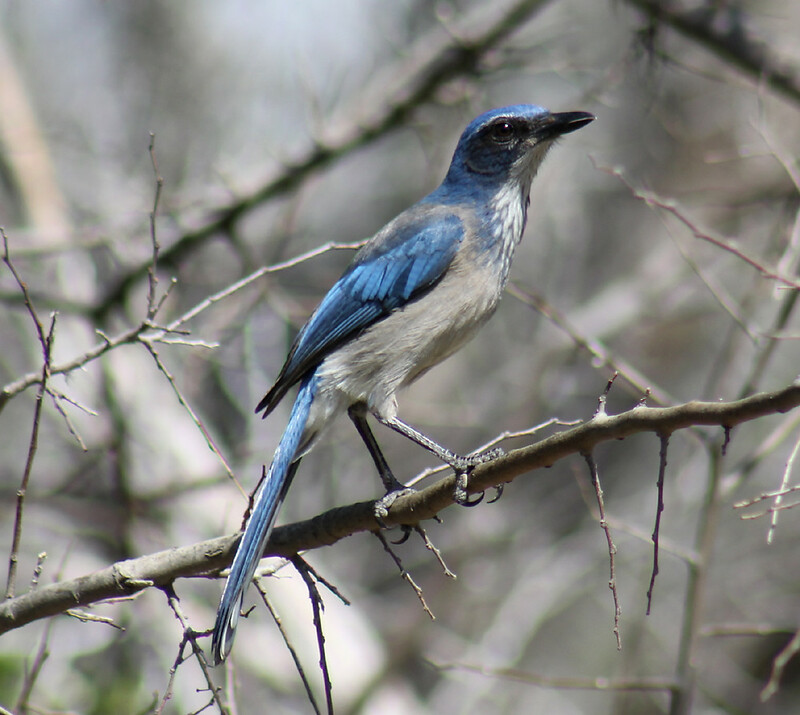 This summer, many birders who have birded across the southwest US were awarded an armchair tick with the AOU split of Western Scrub-Jay in to 2 species; Woodhouse's Scrub-Jay and California Scrub-Jay. 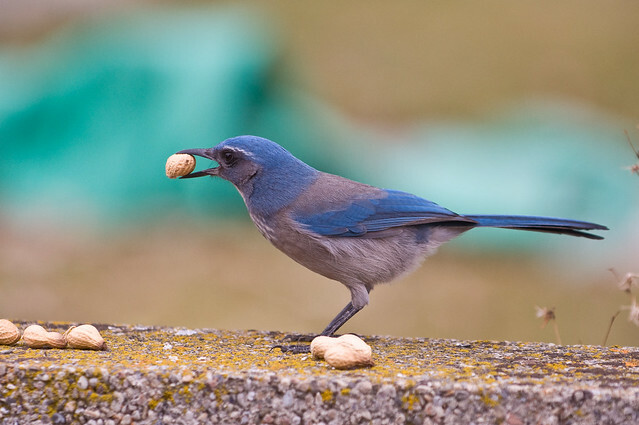 California Scrub-Jay is familiar sight and sound in my yard but scribbled notes of seeing "scrub jays" from a trip to Utah 20 years ago didn't give me any satisfaction to add Woodhouse's to my list purely based on range. However, a family holiday back to southern Utah this summer gave me a chance to actually spend a little time looking at Woodhouse's and an excuse to brush up ahead of time on the differences between the two species. This is a summary of existing published research and some of my own insights from looking at lots of photos on the web. Hopefully, it may be useful to others who are thinking of revisiting scrub-jays after the split. Feel free to use the comment box at the bottom of the article to give feedback and point out errors. All mistakes are my own. I'll do my best to make corrections and attributions as quickly as possible in order to make this summary accurate. The scrub-jays of North America have had a pretty volatile taxonomic history in terms of splitting, lumping and re-splitting on the AOU checklist. 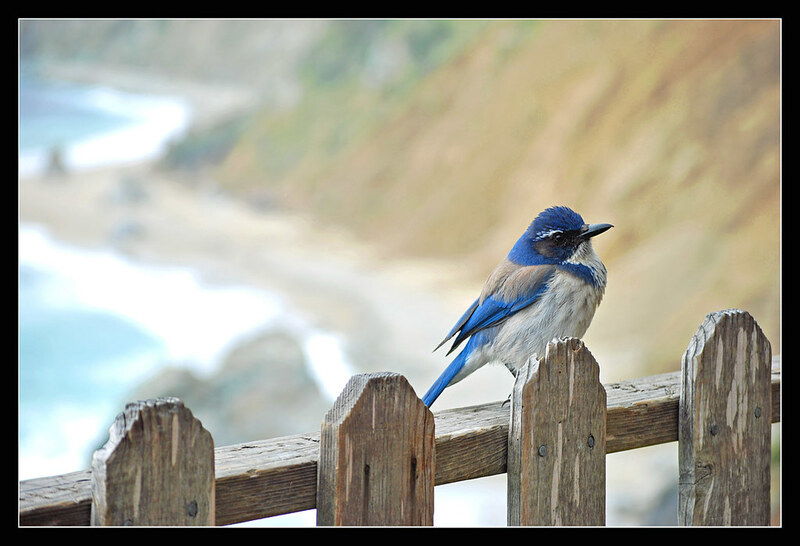 However, it was recent DNA studies by Delaney (2008) among others that demonstrated California Scrub-Jay californica was as distinct from Woodhouse's Scrub-Jay woodhouseii as it is from the currently split and genetically isolated Island Scrub-Jay insularis of Santa Cruz Island off the southern California coast. This DNA research consequently formed part of the data in the 2009 proposal to split Western in to two species by Cicero, Dunn and Garrett. 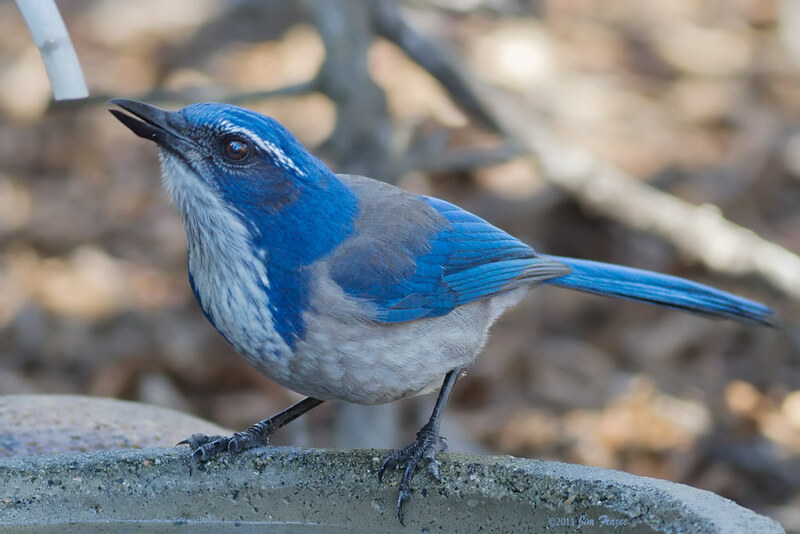 The California Scrub-Jay californica occupies the "outer" or westernmost region of the range and Woodhouse's woodhouseii the "interior" or eastern part of the range. The two species currently barely overlap in range, although they come into proximity in the western Great Basin. 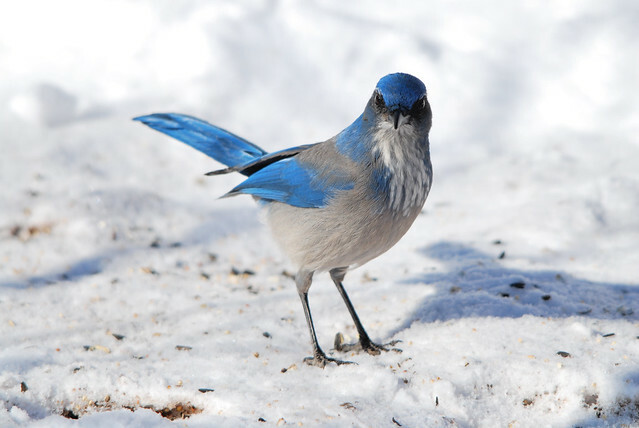 In the Owens Valley of eastern California, Woodhouse's Scrub-Jay breeds in the dry mountain ranges to the east whilst California Scub-Jay is found in oak canyons to the west. The only place that possible hybridization occurs is the Pine Nut Mountains of Nevada. However, even in this small area of overlap, it appears that the region isn't overrun by large numbers of hybrids (Cicero, Dunn and Garrett 2009). As noted above, the scrub-jays have had a bit of an identity crisis over the past century, when it comes to AOU recognition. The 3rd edition of the AOU Check-list saw no fewer than 6 species of Aphelocoma Jay in the US. These included Florida, California, Woodhouse's, Blue-eared, Texas and Santa Cruz Jays. 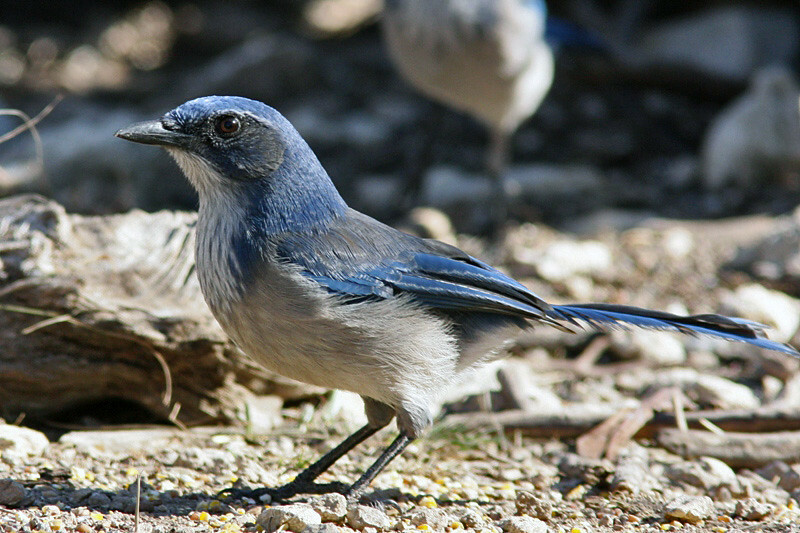 The 4th edition (1931) kept Santa Cruz insularis and Florida Scrub-Jays coerulescens as separate species but lumped the rest in to the "Western" complex. The 5th edition in 1957 went even further and lumped all of them including Florida and Santa Cruz back in to a single species Scrub Jay Aphelocoma coerulescens. The 6th edition (1983) alluded to the possibility that there could be four species (Island, California, Woodhouse's and Florida). 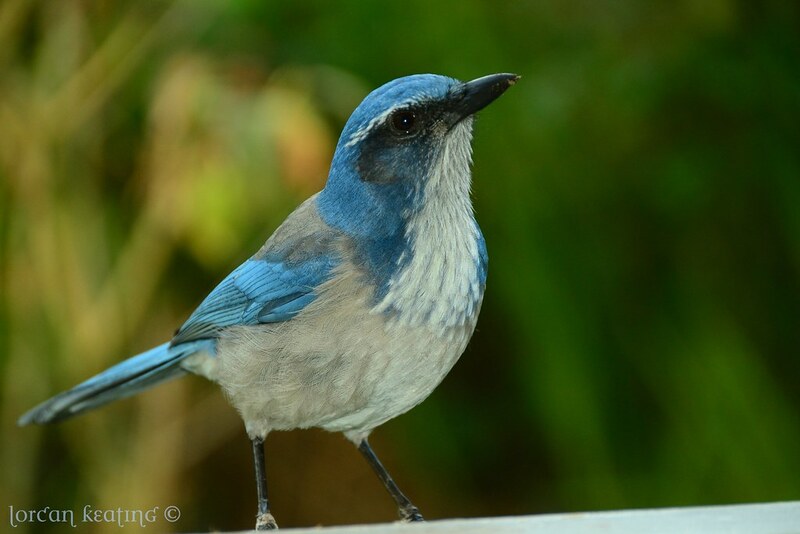 But it wasn't until 1995 that Island and Florida Scrub-Jays were split out again as separate species with a note that Western Scrub-Jay may actually contain two species californica and woodhouseii. 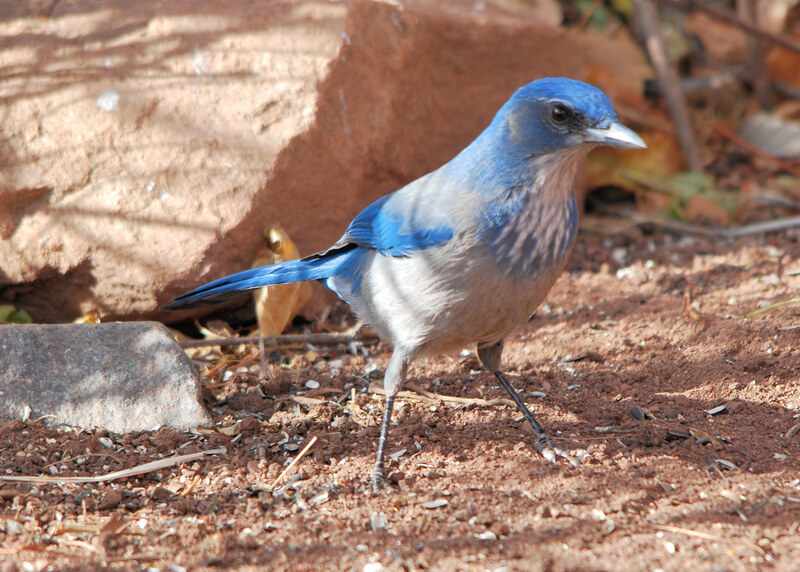 Despite notes in Check-list editions since then confirming the belief that more than one species was involved, "Western" Scrub-Jay remained in effect until 2016. Any summary of taxonomic history would be remiss not to mention the important work of Pitelka (1951), whose work was the foundation for future research on Aphelocoma jays and divided the scrub-jay subspecies into four major groupings (California Scrub-Jay, Woodhouse's Scrub-Jay, Arizona/Mexican Jay and Florida Scrub-Jay). The largest of these groupings was the California californica group, consisting of subspecies found in Oregon, California, and Baja California and including Island Scrub-Jay insularis. 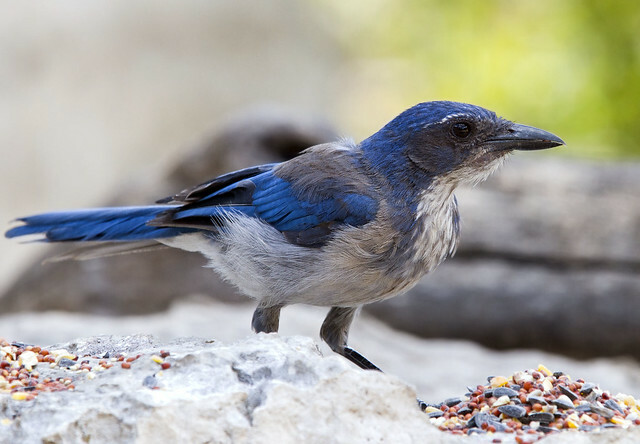 At the time, Pitelka did not have the advantage of using DNA analysis when determining the subspecies of Western Scrub-Jay, and therefore had to rely solely on plumage and habitat characteristics. Pitelka’s visual observations still hold today, describing the coastal californica group as bright blue in color with whitish underparts and characterized by a contrasting plumage pattern and a heavy bill and short wings. The interior woodhouseii group was described as dull blue in color with grayish underparts, lacking the contrast of plumage and characterized by a longer bill, but not so heavily basally, and longer wings. Island Scrub-Jay Aphelocoma insularis. 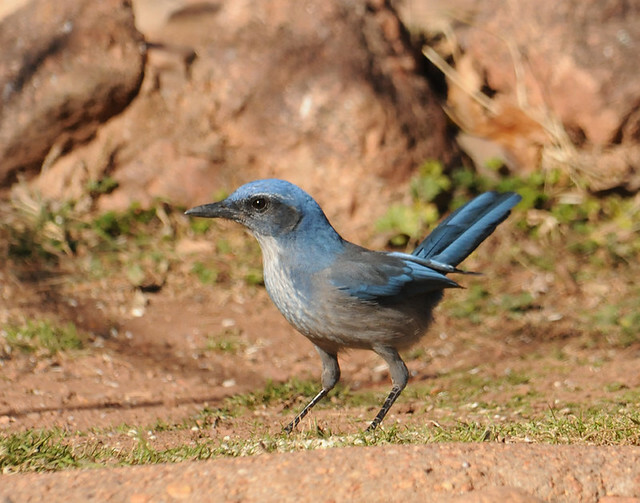 The Santa Cruz Island Scrub-Jay was initially described as a distinct species, A. insularis on the basis of strong morphological contrasts between the insular population and mainland scrub-jay races (Henshaw 1886). However, the A.O.U . Check-list Committee (1957) considered it a well-marked subspecies until 1995 when scrub-jays were split in to three species: Western, Island and Florida Scrub-Jays. Separating any tricky species pair usually requires looking at a suite of characteristics. 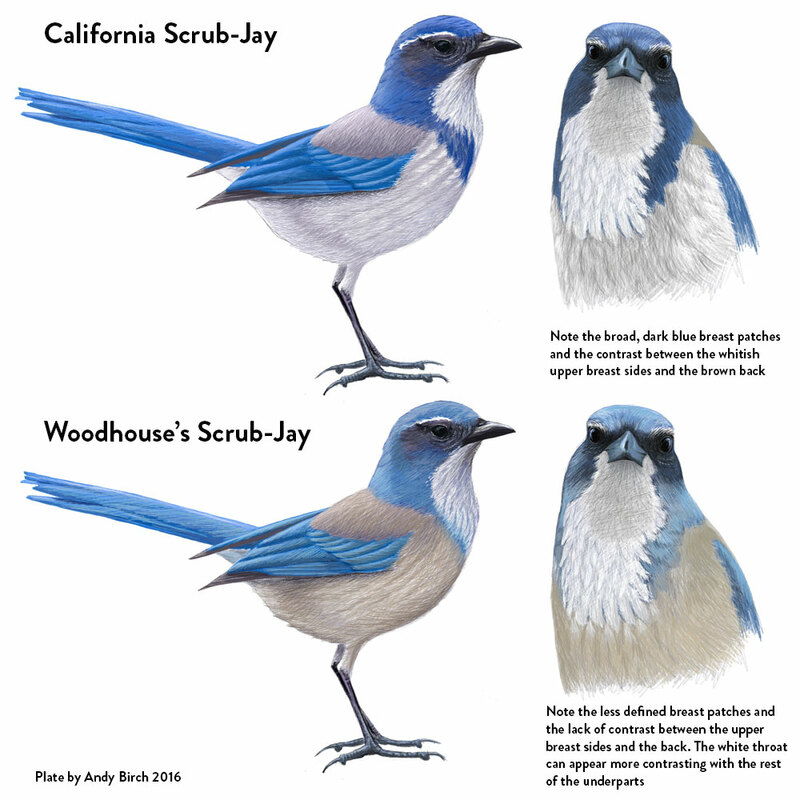 Separating Woodhouse's and California Scrub-Jays is no exception. The Texas subspecies texana also makes it a little more complex - see texanaphotos and notes below. Woodhouse's is generally a duller bird with less intense blues on the back, wings and tail. The blue is typically described as light blue or blue/gray. However, see texana below. Various authors cite auriculars that are less blackish and a less prominent and extensive white supercilium than on California. This might be true as a generalization of classic birds but in an internet search of images, I personally found these features a little variable and would not use as a sole identification feature. The saddle on the back is brown-gray and duller than on California. On classic birds, the throat is whitish/gray and often contrasts sharply with the darker breast and belly compared to California. However, there are photographic examples (some included on this page below) of birds with dirty/white throats not creating a contrast with the breast. The pale blue breast patches (sometimes referred to as necklaces) are less extensive and less contrasting than on California. This feature seems to be the best and most robust feature holding up well on a variety of birds, including Texas birds texana that approach California in many other aspects of the plumage. The upper breast is a brownish-gray and appreciably darker than the whitish-gray breast of California. Another good feature, in reasonable light, is that the upper breast sides (where the breast meets the bend of the wing) is similar in shade and often concolorous with the brown-gray back creating little to no contrast between the back and the upper breast feathers. In turn, the whitish throat contrasts sharply with the rest of the underparts. Various articles cite differences in the blue breast band with California apparently showing a more complete breast band than Woodhouse’s. Perhaps, this is true on classic birds but both species have rather shaggy throat feathers that often cover the breast band making this feature somewhat variable and certainly difficult to verify in the many photos on the web. On classic birds, the undertail coverts are usually lightish blue compared to the white undertail coverts of California. However, this appears to be a somewhat variable feature. For example, see this Jay from Arizona and also one of the thumbnail photos below. 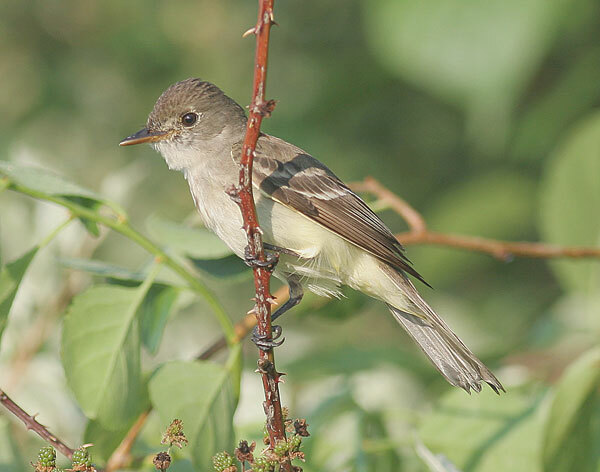 Texas birds texana (see photos below) also seem to consistently show whitish undertail coverts. Texana also show other pro-California features such as whiter breasts, darker blue upperparts and stronger hooked bills. The bill is cited as being more slender/pointed and less hooked than California. This feature seems to be readily visible on many photos with the exception of texana. Dunn and Garrett (2001) described vocal differences with the calls of woodhouseii consistently higher pitched and on average consist of two syllables compared with the harsher, lower pitched, and one syllabled notes from californica. The following summary is from (Cicero, Dunn and Garrett 2009). Resident from southeastern Oregon, southern Idaho, southwestern Wyoming, western, north -central and southeastern Colorado, and extreme western Oklahoma south to eastern California (from White Mountains to Providence Mountains), southern Ariz ona, and in Mexican highlands to northeastern Sonora, Jalisco, central Guanajuato, México, Distrito Federal, and Hidalgo, and east to northern (panhand le), western and central Texas. Rare to uncommon, and irregular, to lowlands of southeastern California, southern Arizona, northeast Sonora, eastern Colorado, and extreme southwest Kansas. John Schmitt has an excellent note on a Woodhouse’s that he discovered amongst California Scrub-Jays in Kern Co, CA. 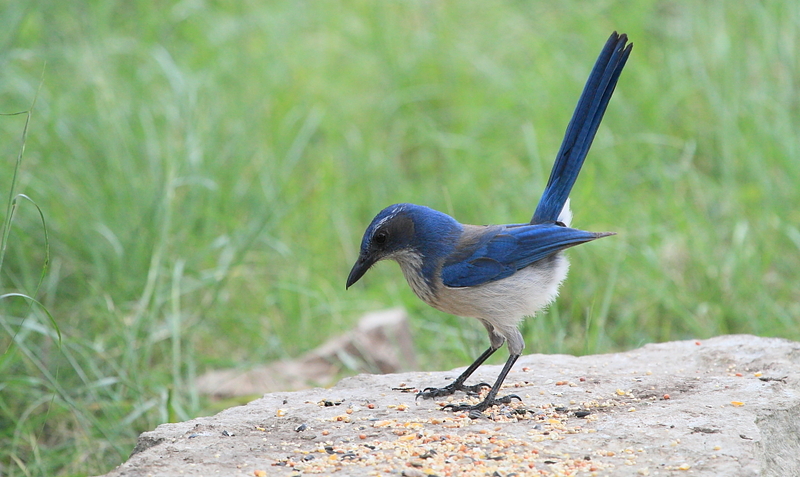 Unlike Woodhouse's, California Scrub-Jay is more contrasting. It's upperparts are a deeper, more vibrant and saturated blue, contrasting with the whiter underparts. Authors cite auriculars that are more blackish and a broader, longer white supercilium. This might be true as a generalization but in an internet search of images, I personally found these features a little variable and not to be used as a sole identification feature. The saddle on the back is browner and is darker and richer in tone than on Woodhouse's. The throat is whitish/gray and often a similar color to the breast not creating any great contrast between throat and breast. The blue breast patches around the upper breast are broad, darker and strongly contrasting with the paler breast. This seems to be a consistent feature. The breast and rest of underparts are a gray-white and significantly lighter than the brown back. On most birds, the upper breast sides are appreciably paler and contrast with the brown-gray back. The undertail coverts are white. Following summary is from (Cicero, Dunn and Garrett 2009). Resident from west-central Washington south through we stern and central Oregon, California (except eastern and southeastern mount ains) and northwestern and west-central Nevada to southern Baja California. Casual to coastal and eastern Washington, and to southeastern California (Mohave Desert and the Imperial Valley). In this context, it is interesting to note the movements of out-of-range scrub-jays, as there certainly have been wayward scrub-jays recorded seemingly of both species. Both species do undertake non-breeding dispersal particularly Woodhouse's, when major invasions can send numbers of birds far afield into lowland desert areas (Cicero, Dunn and Garrett 2009). 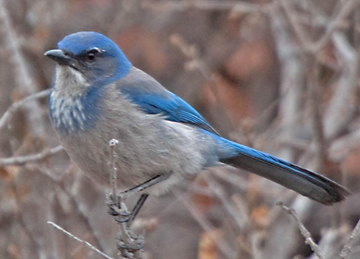 Woodhouse's have been seen in fall on the west slope of the Sierra Nevada at McGurk Meadow, Yosemite National Park, and California Scrub-Jay are noted in the Mohave Desert and one from the Imperial Valley of California (Dunn and Garrett 2001). In the Pacific Northwest, California Scrub-Jay is rapidly spreading north in western Washington, as noted by Wahl et al. 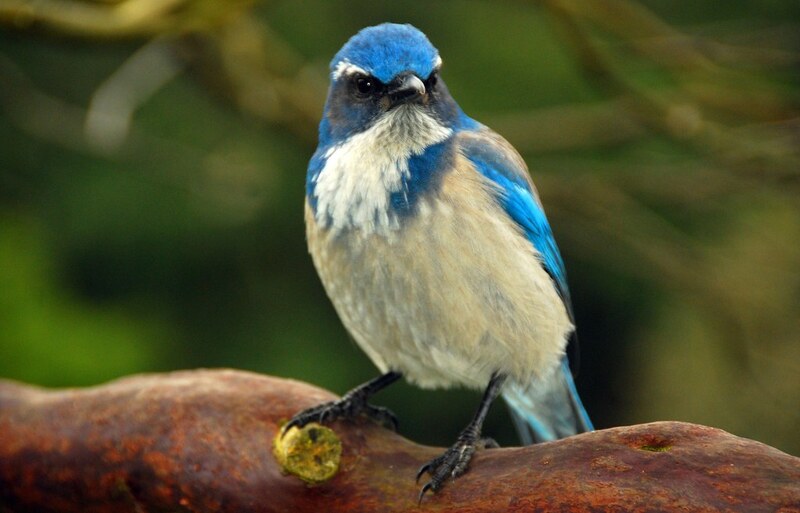 (2005): “Scrub-jays have exhibited one of the most dramatic range expansions of any Washington species in the last several decades.” There are various records from Idaho of California Scrub-Jay (see this ebird report for photos). 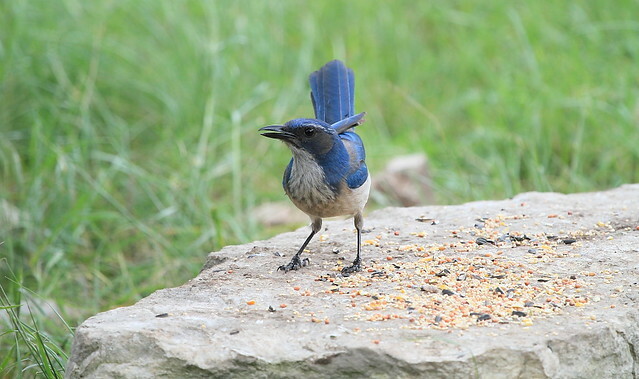 In Montanta, Jim Greaves has recorded a California in his yard and this Sept' has seen Arizona's first California Scrub-Jay from Yuma., some 80 miles from the nearest population. To reach Yuma, this bird must have crossed both inhospitable desert and vast agricultural lands. However implausible as it may sound, it's possible that any out of range scrub-jay east of the Rockies may not necessarily be a Woodhouse's by default. 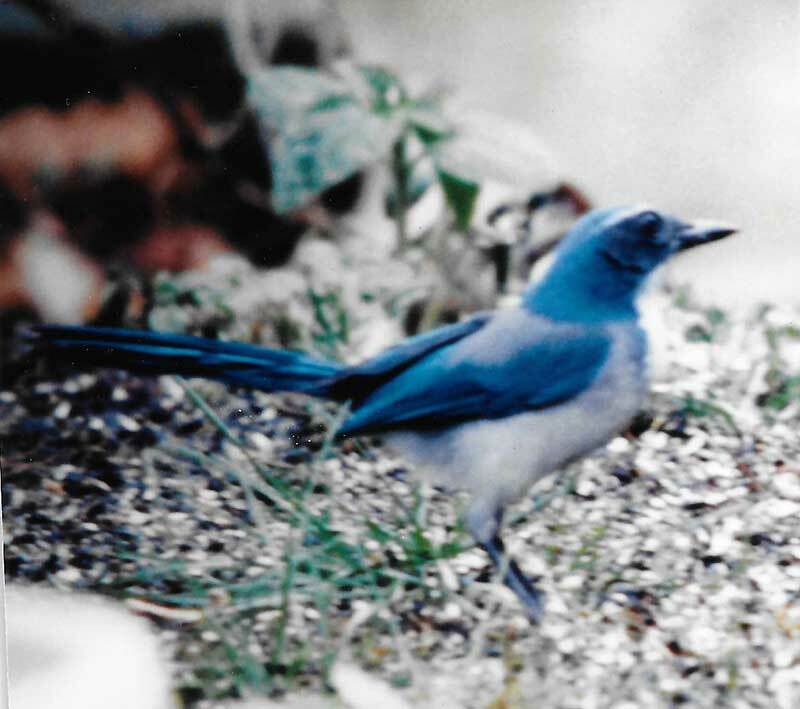 The Indiana bird from 1999 was accepted as a Woodhouse's Scrub-Jay. See page 3 of this pdf for a photo. Admittedly, it's hard and probably foolish to make assumptions from an almost 20 year-old photo that has been printed and then scanned as a pdf! However, the relatively broad and contrasting blue breast patches, dark blue upperparts, relatively pale underparts and white undertail coverts don't scream classic Woodhouse's to my eyes. Difficult to judge accurately, but perhaps, the upper breast sides (where they meet the back) look paler too? In my search for photos of birds from the Rockies (which would be the most likely source of this vagrant), I couldn't find birds that look like this, so would love to know if anyone has links to Rockies birds that do resemble this bird in plumage. If this is a Woodhouse's, this bird reminds me more of the photos of texana. 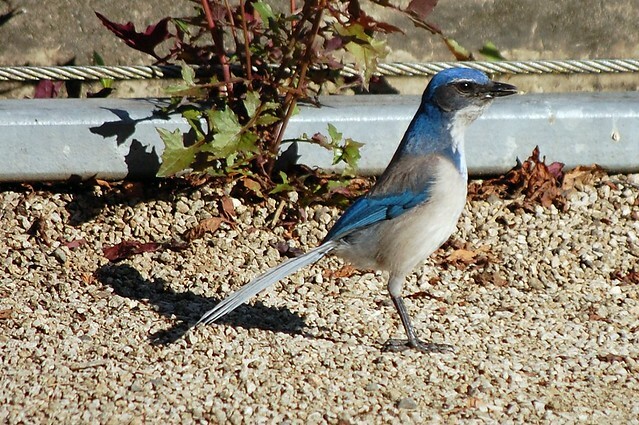 Otherwise, I'm not sure why this couldn't be a strong candidate for California Scrub-Jay. EDIT Alan Bruner from the Indiana Bird Report Archives kindly dug out several descriptions and another color photo from Tim Keller. This photo and the descriptions swing me in to the Woodhouse's camp, which was the original conclusion made by the Indiana Bird Records Committee. Note the weak blue breast patches and the upper breast sides concolorous with the back. Also to help seal the deal, some of the descriptions mention light blue undertail coverts. Just goes to show not to make hasty attempts at ID from a single photo! Hopefully, with this renewed interest in scrub-jays, further advancement in their ID will be forthcoming and we will learn more about their range and vagrancy. Lots to learn and discover! Grinnell, J. & Miller, A.H. 1944. The Distribution of Birds of California. Pacific Coast Avifauna Number 27: 287-291. Peterson, A. Townsend. 1992. Phylogeny and Rates of Molecular Evolution in the Aphelocoma Jays (Corvidae). The Auk 109(1): 133-147. Pitelka, Frank A. 1951. Speciation and Ecologic Distribution in American Jays of the Genus Aphelocoma. Vol 50(3): 195-464. University of California Publications in Zoology, University of California Press. Berkeley, CA. Pyle, Peter. 1997. Identification Guide to North American Birds, Part One. Pgs 302-303. Slate Creek Press. Bolinas, CA.